Hello Vida Juicer! Welcome to “Wellness Wednesday” with Juice With Us. We’ve got a great topic for you today, How and Why Juicing Eliminates Toxins. Juicing has become a great alternative among those who want to “clean” their bodies from the inside out. While there is plenty of research that shows juicing is healthy, it also helps to know exactly how these juices eliminate the toxins from your body. The main benefit from juicing vegetables comes from the amount of nutrients that your body receives while you are doing it. As you drink the juices, these nutrients bathe your cells, which forces them to release the acids that are stored within them. Once released from the cells, the acids can then be removed by the kidneys, lungs, and skin. 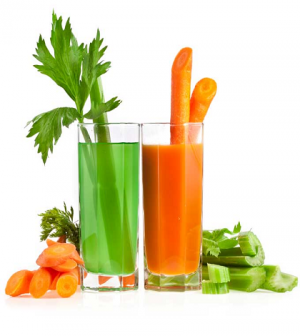 Drinking healthy vegetable juices also provides your digestive system with beneficial enzymes. These enzymes allow your body to break down the foods you eat, turning them into the nutrients that the body can use. Since you are adding enzymes, and providing the nutrients in an easier to digest form than traditional foods, your body is able to absorb more nutrients, which helps to flush out the system. 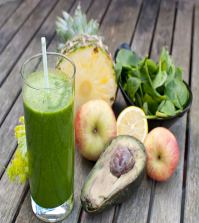 The main reason people start juicing is to detoxify, which does happen. However, the other side of the equation is that you aren’t taking in as many toxins during the process – especially if you are doing a juice fast. Over time, the amount of toxins in the body overwhelm the organs responsible for getting rid of them. Since these toxins come from eating processed foods, high fat and sugar contents, and even chemicals and pesticides, the amount just continues to add up in the body. When you begin juicing, you are doing two things; first, you are giving the body all those nutrients, and second, you aren’t adding even more toxins to the mix that are already inside you. 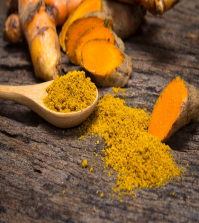 This allows your liver, kidneys, and lungs to “catch up” on their elimination, which results in the overall improvements in the removal process. When you decide to go on a juice cleanse, you are making the conscious effort to avoid the foods that are high in toxins, and substitute them with organic fruits and vegetables that are considered “clean,” as they have no added pesticides, antibiotics, and other chemicals. The nutrients in raw juices do amazing things for your body. Another way in which the toxins are eliminated is because you are essentially giving your digestive system a break. Juices are much easier to digest, so they don’t require as much energy expenditure by the digestive system. This allows the nutrients to be absorbed faster, which promotes the healing of tissues within the intestinal walls. The final way in which juicing eliminates toxins is because you are providing your body with more water. Considering that most adults don’t consume enough water in their normal diet, the additional liquids from the juicing help to flush all those toxins that are being released. Now that you know how juicing helps to get rid of toxins in the body, you can finally get started with juicing and changing to a healthy lifestyle that will provide many benefits to your body. If you enjoyed this content tell us or even ask questions about it. Until next week Juice Strong to Live Long!